International reaction has been coming in following the UK vote to leave the European Union. "We now expect the United Kingdom government to give effect to this decision of the British people as soon as possible, however painful that process may be. Any delay would unnecessarily prolong uncertainty. "We hope to have the UK as a close partner of the EU also in the future." "This is a painful choice and it is deeply regrettable both for the UK and Europe. But this choice is theirs and we must respect it, accepting all the consequences. "The British vote is a tough test for Europe." "We take note of the British people's decision with regret. There is no doubt that this is a blow to Europe and to the European unification process." 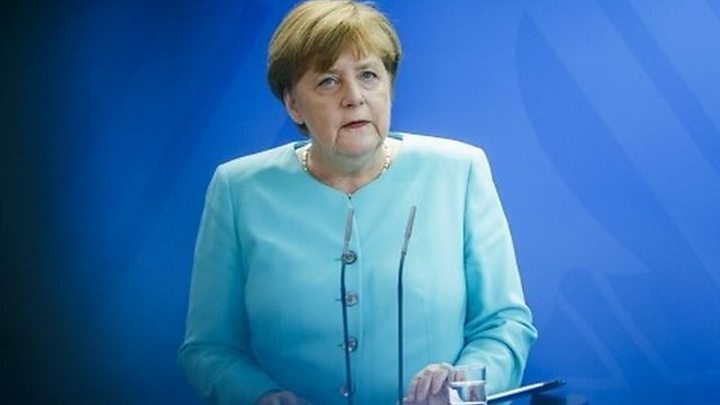 Mrs Merkel said that because of its history, Germany has "a particular interest and a particular responsibility" to make European unity a success. "The people of the United Kingdom have spoken, and we respect their decision. The special relationship between the United States and the United Kingdom is enduring, and the United Kingdom's membership in Nato remains a vital cornerstone of US foreign, security, and economic policy. "So too is our relationship with the European Union, which has done so much to promote stability, stimulate economic growth, and foster the spread of democratic values and ideals across the continent and beyond. "The United Kingdom and the European Union will remain indispensable partners of the United States even as they begin negotiating their ongoing relationship to ensure continued stability, security, and prosperity for Europe, Great Britain and Northern Ireland, and the world." Media captionDutch far-right politician Geert Wilders says Brexit means the EU is "more or less dead". The UK vote to leave the European Union comes amid rising Euroscepticism in Europe. Some in the EU fear the result could reverse 70 years of European integration. 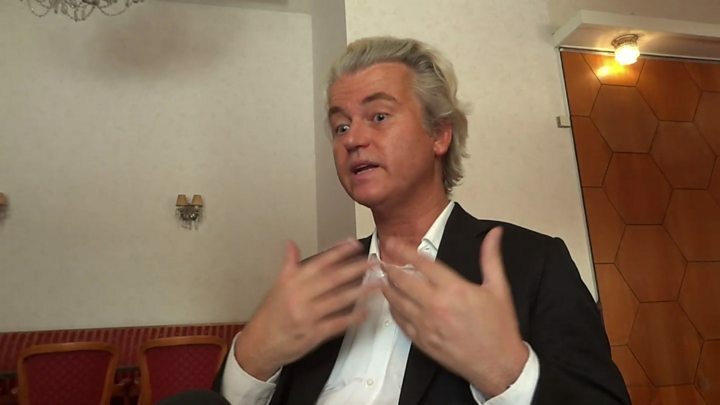 Dutch far-right politician Geert Wilders, whose Party for Freedom (PVV) opposes immigration, told the BBC he believed the end of the EU was now just "a matter of time". He also tweeted that it was "time for a Dutch referendum". "Victory for freedom! The British people have given to Europeans and to all the people of the world a shining lesson in democracy. "As I have been asking for years, now we need to have the same referendum in France and in the countries of the EU." "I am very sorry that the result of the referendum is for the UK to leave the European Union. However, the British people have spoken and we fully respect their decision. "Ireland will, of course, remain a member of the European Union. That is profoundly in our national interest." After the UK leaves the EU, its only land border with an EU country will be between Ireland and Northern Ireland. Mr Kenny said the Irish government would "do our utmost" to maintain a pre-EU agreement of an open border for travellers and "minimise any possible disruptions to the flow of people, goods and services between these islands". "It's an explosive shock. At stake is the break-up pure and simple of the union. "Now is the time to invent another Europe." "A statement by the Prime Minister of Great Britain Mr Cameron before... the referendum, in which he voiced the position of Russia [that Moscow would benefit from Brexit] has no basis. I think this is nothing more than a flawed attempt to influence public opinion in his own country. "As we can see, even this did not bring the right result for those who did it, and moreover after the vote no-one has the right to make statements about some position of Russia. This is nothing more than a demonstration of the low level of political culture." "Today the most urgent challenge the European Union is facing is finding a way to the hearts and minds of Eurosceptics in order not to leave a single chance to opponents of the European integration project and their generous sponsors. I do hope that the sanctions against Russia as an aggressor state will be extended." "The UK will remain a strong and committed Nato ally, and will continue to play its leading role in our alliance. "Today, as we face more instability and uncertainty, Nato is more important than ever as a platform for co-operation among European allies, and between Europe and North America. A strong, united and determined Nato remains an essential pillar of stability in a turbulent world, and a key contributor to international peace and security. "The alliance remains committed to closer cooperation with the European Union." "We urge the authorities in the UK and Europe to work collaboratively to ensure a smooth transition to a new economic relationship between the UK and the EU, including by clarifying the procedures and broad objectives that will guide the process." "We recognise that excessive volatility and disorderly movements in exchange rates can have adverse implications for economic and financial stability. "G7 central banks have taken steps to ensure adequate liquidity and to support the functioning of markets. We stand ready to use the established liquidity instruments to that end." "The people of the UK have chosen to leave the EU. "The UK and the EU are important strategic partners for Canada with whom we enjoy deep historical ties and common values. We will continue to build relations with both parties as they forge a new relationship. "Canada's connections to our partners around the world are among its greatest assets, and these relationships contribute greatly to the prosperity of all Canadians. "Canada has tremendous economic fundamentals that we are strengthening with key investments in infrastructure and measures to grow our middle class. We are well positioned to weather global market uncertainty as we have done in the past." "This is a sad day for us, but we will respect the will of the British people. This is not a funeral for Europe. This can be a new start for Europe, and we will regain the confidence of the citizens." "Exit negotiations should be concluded within 2 years at max. There cannot be any special treatment. Leave means leave." "The debate and campaigning in the run-up to the referendum should serve as a wake-up call for Europe. They elicited stark polarisation and disturbing nationalism. This shows that EU cooperation must be developed and improved." "A domino effect on other countries cannot be ruled out." He told Austrian radio that the EU as a whole would survive. "Spain will remain committed to the EU. The EU is the area of greatest prosperity and wellbeing; we will continue building a better future between us. "We need stability. Above all we will continue defending Spaniards' interests and greater European integration. "Spain now has a solid economic base in order to weather the financial turbulence which Brexit could cause. We are prepared." "I wish everybody a lot of luck. It's historic." The presidential hopeful is visiting a golf resort he owns in Scotland today. He said it is a "great thing" that the people of the UK have "taken back their country". "We respect the choice the people of the United Kingdom have made. "Our first task has to be to make sure that the economic uncertainty created by these events does not hurt working families here in America. We also have to make clear America's steadfast commitment to the special relationship with Britain and the transatlantic alliance with Europe. "This time of uncertainty only underscores the need for calm, steady, experienced leadership in the White House to protect Americans' pocketbooks and livelihoods, to support our friends and allies, to stand up to our adversaries, and to defend our interests. It also underscores the need for us to pull together to solve our challenges as a country, not tear each other down." "Brexit will be either a wake-up call or the beginning of a dangerous path for European people. "We respect the decision of British people, which confirms the deep political and identity crisis of the EU. "The extreme choices of austerity that widened the inequality between countries of the north and south, fences and closed borders and the denial to share the burden of the debt and migrant crises had signalled an extended crisis in Europe." "Now, as the United Kingdom and other EU member states embark on the process of charting a way forward, the secretary general trusts in Europe's well-proven history of pragmatism and common responsibility in the interest of European citizens. "At the UN, we look forward to continuing our work with the United Kingdom and the European Union - both important partners. "The secretary general expects the European Union to continue to be a solid partner for the United Nations on development and humanitarian issues, as well as peace and security, including migration. "He also expects that the United Kingdom will continue to exercise its leadership in many areas, including development. He very much hopes that this will continue. "When we work together, we are stronger." "It will take two years for the institutional changes that this vote implies to be negotiated and we remain committed to retaining strong trade and financial relations with both Britain and the European Union. "The uncertainty that arises from this vote means that the volatility that has characterised capital markets in the lead-up to the vote may persist. "The National Treasury and the South African Reserve Bank have been in discussions with financial institutions on the possible implications for the South African economy. Our banks and financial institutions are well positioned to withstand financial shocks to the system as demonstrated in previous episodes including the 2008/09 global financial crisis. "We are therefore confident that our financial system including the banks and the regulatory framework are extremely resilient and reliable." "Let's realise that a great part of people living in Europe reject the EU's migration policy, there is great dissatisfaction with the EU's economic policy. "It is up to us, the remaining 27 union member states, whether we find enough strength to say that fundamental policies of the EU must go through fundamental changes." Slovakia will take on the six-month presidency of the EU from next month. "Britain's decision is serious and irreversible. "The EU has to change. Not because Britain left, but because the European project needs much stronger support from citizens. "The EU is for us, the Czech Republic, the best possible guarantee of stability, peace and prosperity." "One must do everything to prevent other countries from leaving." "We have to serenely respect the decision of the majority of the British people, in the certainty that the European project remains valid to defend the values that mark our common identity." "We believe in a strong Europe, but Europe is strong only if it can give solutions which make it stronger, to significant problems like migration." "Deeply sad for the EU referendum result. We will go on and stay strong with 27, but EU will not be the same without Great Britain"
"The nation has had its say." Speaking of the negotiations that must come between the UK and the EU following this vote, he said: "Any retaliation and whinge is out of the question." "The EU should read this development very well and reassess its future vision." "A sad day for Europe and for European and international friends of Great Britain. "The European edifice needs reconfirmation more than ever. Moldova remains attached to its European course despite the results of the referendum in the UK because we consider the EU a successful project and we want to be part of it, based on reforms, during the next years." "Romania will negotiate so that its interest is protected and the interest of our citizens who live and work in Great Britain is protected." "British voters and many other voters around Europe feel that the EU is not providing good enough answers to today's challenges." "We are very concerned over the risks to the global economy, and financial and exchange markets." "A prosperous Europe is in the interests of all parties and China is willing to keep co-operating with Britain and is fully confident in China-EU ties." "In this globalized world, volatility and uncertainty are the new norms. This verdict will obviously further contribute to such volatility not least because its full implications for the UK, Europe and the rest of the world are still uncertain. "All countries around the world will have to brace themselves for a period of possible turbulence while being watchful about, and alert to, the referendum's medium term impacts." "There will be testing times ahead for the UK. But the British people should know that one old friend will always be with them, as they open a new chapter in their long history." "Other developed countries also face similar challenges as Britain. We all live in a globalised, interdependent world. The desire to disengage, to be less constrained by one's partners, to be free to do things entirely as one chooses, is entirely understandable. And yet in reality for many countries, disengaging and turning inwards will likely lead to less security, less prosperity, and a dimmer future. "Singapore will continue to cultivate our ties with Britain, which is a long standing friend and partner." "The impact on Australia immediately, directly, from a legal point of view, will be very limited because it will take some years for the United Kingdom to leave the European Union, to negotiate an exit. However, we've seen already large falls on stock markets and there will be a degree of uncertainty for some time."